Mia Haas had moved far away from the small North Dakota town where she had grown up with her twin brother Lucas and alcoholic mother, Mimi. Her brother had returned to their hometown and became the high school English teacher. He went missing just as the body of one of his students was found, and the entire town was convinced he did it. 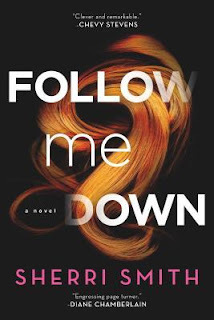 This is Sherri Smith's first thriller, but the pacing is terrific. We're given flashbacks and background into relationships between all of the characters as Mia interacts with the police, other residents in Wyoata, as well as her own memories. The small town residents are narrow-minded and only too eager to paint Lucas as a killer. Having Mia upset the narrative brings out their prejudices, and we can feel her desperation in looking for an alternative explanation for the murder. It's almost claustrophobic at times in Mia's head, her tangled thoughts and conflicted emotions. She goes pretty far in her investigation, even though she has no experience doing so, bungles a lot of it, and is in harm's way. There are lots of red herrings and little details that heighten the paranoia until you reach the end and discover the truth. It was quite the shock but isn't a cheap cop out. If anything, it's even more sad and pitiful for the poor murder victim and all of the other people left traumatized in her wake. No one is perfect here, and it feels as though you're right there with them, struggling. This is a fantastic book and kept me in suspense until the last page.